Of course, summer is the warmest season throughout Utah and some of the state’s most popular attractions and national parks experience triple-digit days. To beat the heat in Utah this summer, we recommend a visit to cool, refreshing Park City. Located just 20 miles East of Salt Lake City along highway 80, Park City has 400 miles of trails for hiking and biking. The town’s ski resorts offer lift-assisted scenic rides on their chairlifts. And guests this summer can enjoy the Summit Bike Share – E-bikes that can be rented by the hour, to explore the mountain town and enjoy a little pedal-assisted boost if the terrain gets too steep. The Utah Olympic Park also is an exciting attraction and the alpine coasters at the Park City Mountain Adventure Zone are the town’s most popular attraction outside of the town’s historic district which dates from 1870. The Utah Symphony performs regularly in Deer Valley throughout the summer at the Deer Valley Music Festival, showcasing artists from Broadway, Opera, Country and Rock genres. Many people spend their summer weekends looking for activities to enjoy nature, while others fill their Saturday mornings with service projects. Why not combine the two? Survivors at the Summit, an annual fundraiser for the Cancer Wellness House, hosts people from all over to honor loved ones fighting cancer as well as pay tribute to those who have lost their lives fighting the disease. The 22nd annual installment of the event returns to Snowbird Resort on July 7th. 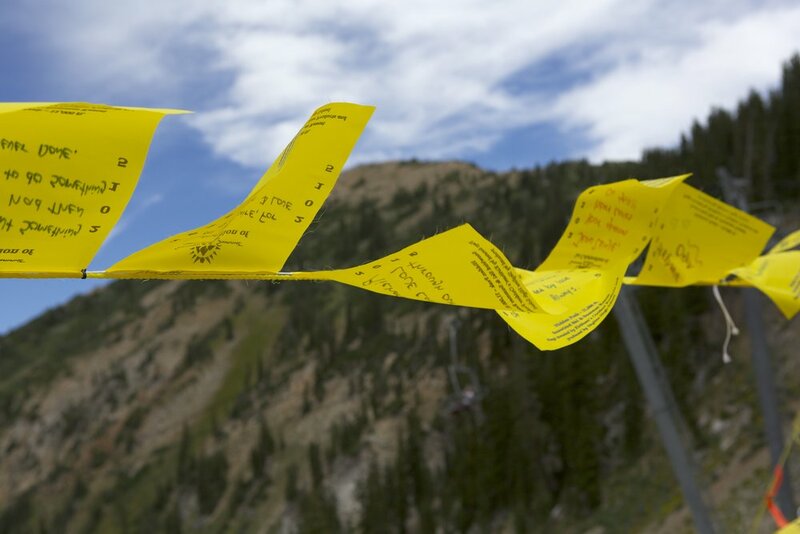 Registration includes a tram ride or hike to the summit, breakfast AND lunch, prayer flags, live music and a celebration at the beautiful summit of Snowbird. There really is not a better value out there and you get to help a fantastic cause. Ho can you beat that? It is the definition of a win-win. Looking to get the most out of summer's waning moments with a family-friendly event at the end of August? Look no further than North Ogden City's annual Chalk Festival. North Ogden City and JUST-a-BREAK are putting on the third annual Chalk it Up North Festival On August 24 and 25. Chalk it Up North is an annual fundraiser for JUST-a-BREAK. The foundation was established with the idea of having communities support local cancer patients, caregivers and families to literally “take a break” from the financial and emotional strains of cancer. The two-day, family-friendly event includes a 24-hour chalk art competition (featuring local and nationally known artists), a 5K color run, live music, raffles, food trucks, face painting, local entertainment and other activities for kids. For more information and the festival on the festival, click here or register for the 5K or to be an artist here. We just got done taking a weeklong trip to Eden, Utah and we stayed in a cabin and it was AMAZING! Fantastic hiking. There was a pond and a rope swing. There was also a ball field where we were able to play kickball as a family. I think Eden is a hidden gem of Utah. If you are looking in SLC area, I would say Tracy Aviary in Liberty Park is perfect for the whole family. There are so many beautiful birds inside the Aviary, and then you step right out into Liberty Park and can enjoy a fun family picnic. There are huge shady trees, gorgeous flowers, carnival rides for little ones and a couple different walking paths. There is so much to see and enjoy, you won't be able to do it all in one visit! If you are open to any area, a campout at the Little Sahara Sand dunes is such a fun family adventure. My boys were in heaven in Utah's largest sandbox. Once they went to sleep, my husband and I were able to enjoy an amazing view of the moon and stars. It is such a big park, we felt totally secluded and just enjoyed time away from WiFi and the world. There are so many trails your family would love. Other activities I'd recommend: taking a walk around Silver Lake with your family and packing a picnic, camping in Albion Basin at the base of the Secret Lake trailhead, or catching breakfast at The Protein Foundry or Sweet Lake Limeade and Biscuits (two of our favorite healthy breakfast spots). There are lots of fun places to see in Utah, but the mountains will always be calling my name. I hope you get to enjoy a visit, or two. Utah is so full of fun things to do in the summer. Some of my family's favorite things include hiking in the beautiful mountains, heading off for a day at the Hogle Zoo, or even just spending a morning walking around Daybreak Lake and then heading over to the farmers market. I am also really looking forward to the Jest Be Well mindfulness retreat that will be in July. I was lucky enough to visit Moab recently and I must say my absolute favorite place to visit was Corona Arch. Located outside of the Arches National Park, Corona Arch can be accessed by foot on a 2.4 mile in and out trail. Best visited early in the morning or at sunset to avoid the blazing Utah sun, this hike is one not to be missed! As you can see, Utah is full of family-friendly adventures for all ages and thrill levels. Now it is up to you to get out and experience all that this incredible state has to offer. Did your favorite summertime tradition make the list? What are some of your favorite Summer activities or events? We'd love to hear your suggestions. Let us know in the comments below or reach out to us on social media. Share this article with someone that needs to get out an explore Utah this summer!